In part 2, I covered Goober’s progress from the time he was placed in the cage until the time we were preparing to separate him from The Grey Fox. Goober’s cage was in our basement and the plan was to catch The Grey Fox and put him in a cage on the first floor of our house. Up to this point, our own two cats had been mostly kept out of the basement except for a couple of supervised visits. Putting The Grey Fox on the first floor meant he would have to deal with our cats’ presence, but would also hopefully be able to benefit from getting used to being around other cats and seeing them interact with us. At the same time, we were hoping Goober would grow to depend on us for comfort without his brother around to use as a crutch. The animal shelter loaned us a cage just a little smaller than the one that Goober was living in. Unfortunately, the cage had previously been used by strong-jawed dogs, judging by the bent bars and broken welds. Since some of the bends were big enough to present a risk of The Grey Fox getting his head stuck, I spent some time straightening them out as best I could. I wrapped sisal rope around one particularly big gap with broken welds, blocking the hole while also creating a small scratching post (which The Grey Fox has never used as far as I can tell). Getting The Grey Fox in the cage was a little trickier than it was for Goober since he didn’t have Goober’s tendency to hide in small places. We spooked him into a hallway in the basement where I could block off access to the main room with a blanket while my wife tried to grab him with a towel and put him into a carrier. It took a few tries, but she finally nabbed him and we got him into the cage without injury to anyone involved. He went through the same first day of exploring and trying to escape as Goober had before settling down. The Grey Fox relaxing in his cage. The Grey Fox adapted to the cage much more quickly than Goober, without as much disruption to his eating and litter box use. It wasn’t long before he was looking relaxed in the cage and lounging out on top of his perch even when we were walking by. His self confidence made the petting exercises progress much more slowly than for Goober, though. The Grey Fox would hiss, bat, and/or bite at the wand at times and never reached a point of relaxation while being petted. At best he would barely tolerate the petting session, his tail twitching the whole time. He would still lick baby food from my fingers, though, and quickly became comfortable enough during meals to start eating before my hand had even left the plate. Since The Grey Fox responded well to catnip, I used that on occasion to mellow him out so that he would accept the wand pettings more readily. This worked well sometimes, but other times he would simply eat the catnip leaf and not show any effect. Our cats’ presence provoked hisses at first, but The Grey Fox quickly became used to them and would only hiss if they came directly up to the cage while he was in the litter box. When we played with a mouse or bird toy with our cats, he would track the movement and eventually he began to play with the toys when we would move them into the cage. With his brother separated from him, Goober unfortunately became more fearful and slightly aggressive, lashing out suddenly at times to an extent that we were unable to continue with the hand and brush pettings and we generally lost progress with the socialization. Once The Grey Fox was caged, we had also allowed our own cats back into the basement. 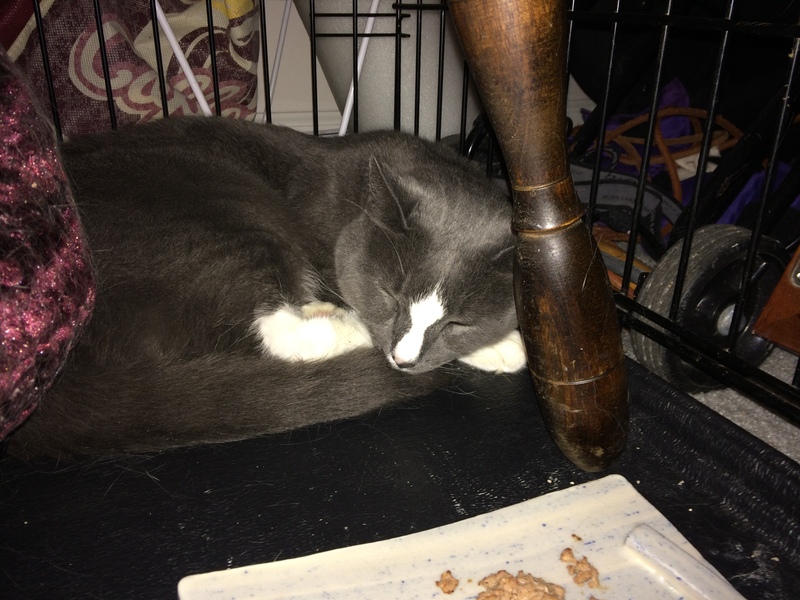 Goober would hiss and swat the cage whenever either of them passed by, so we elevated the cage onto a coffee table to give him a little more privacy and a more secure position. This helped, though it didn’t fully eliminate the problem. By this point we had had the fosters for more than a month. The time commitment and stress of everything we had to deal with was starting to wear on us. Our own cats were also having issues – one was starting to spray more frequently (he’s fixed, but has had spraying issues due to other factors) and the other was starting to become withdrawn, hiding away for much of the day. Because of these factors, we decided it was time to move the foster cats on to a rescue or another foster home. Despite their progress they were nowhere near ready to be adopted to a normal home. We contacted the shelter to let them know and, in the mean time, made plans to move Goober’s cage upstairs next to his brother’s. What we had hoped to accomplish with the separation hadn’t happened. We were still unsure if putting them back together was a good idea because we weren’t sure if they would be able to stay together when they moved on. The Grey Fox had been perfectly fine when separated from Goober, so keeping them together would only hold him back from possible single placement. Homing them separately would be detrimental to Goober, however, unless he could learn to become independent of his brother. In the next post I’ll cover the reunion of the brothers and our progress since then.